How is Bunion Surgery Done and How Long is the Recovery Time? There are multiple types of procedures from which a surgeon may choose to correct a bunion. There isn’t one procedure that’s used to correct all bunions. With a bunion deformity, there’s a bone out of alignment which sticks out, causing the bump. So this bone must be put straight back in proper position. The worse the bunion gets, then the more complicated the operation is to fix it. Smaller bunions are easier to correct. Details on the length of recovery vary from patient to patient as well as with the type of procedure performed. Good information can be provided after a thorough examination by the doctor. Our goal is to fix your foot so you can get back to work and all your fun activities, as soon as possible. 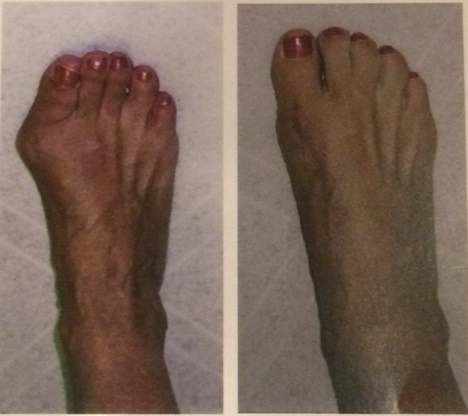 Before and after a bunion surgery. 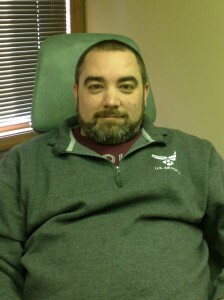 The surgery is performed at an outpatient surgery center and takes about an hour. You don’t have to go to the hospital. When you wake up from the operation it will not hurt. There will be a big soft fluffy bandage on your foot. You are to go home and keep your foot elevated up on pillows. In general, if the foot doesn’t swell then it won’t hurt. If it swells from walking a lot or sitting with your foot hanging down, then there will be pain. Here is where the doctor and patient work together as a team. The doctor does the surgery (Part 1), and the patient rests with the foot elevated to assure good healing (Part 2). Dr. 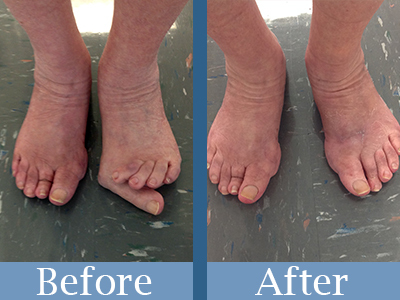 Powers has performed hundreds of bunionectomies over the past 25 years with wonderful results. Many times a walking cast boot is used for a few weeks during the recovery phase. This is an excellent invention. The cast boot protects the foot while allowing early ambulation so you can get around sooner. If you’re ready to get help for a bunion, call Dr. Kevin Powers at (812) 333-4422 in Bloomington, IN. We can offer treatments that will lessen your pain, slow the symptoms, or even end your pain–for good! Bunions are bony bumps located on the inner edge of the foot, and cause an array of problems for those who have them. There is also a related condition known as bunionettes that has a similar set of symptoms and can lead to issues. At our Bloomington, IN podiatrist office, we provide treatment (including bunion surgery) for many patients who suffer from these fairly common toe deformities. Essentially, a bunion is a bony protrusion found at the big toe’s metatarsophalangeal (MTP) joint, which is the point where the toe connects to the foot. The bump extends out to the side, along the inner edge of the foot, in response to instability in the MTP joint and a subsequent misalignment of the bones that form it (the phalangeal and metatarsal bones). In this condition, the phalangeal bone in the big toe begins to angle inwards—towards the other four toes—which then pushes the MTP joint out of position. The most recognizable symptom of the condition is an abnormal bump on the inside of the foot. In many cases, bunions are swollen, red, and sore. Due to friction and pressure on the bunion from footwear, there is usually an increased risk of calluses and corns. This is also a problem when the big toe overlaps the second toe. Other common bunion symptoms include pain that is either persistent or intermittent, and restricted movement of the big toe. Whereas women’s shoes are often blamed, the root cause for bunions is actually pressure from shifting and weight-bearing on joints and tendons in the feet. This is especially the case when force loads are unevenly distributed, which then leads to an unstable MTP joint. Commonly-attributed causes of force load imbalance include traumatic injuries, congenital foot deformities (those present at birth), and inherited foot structure. It was thought for a long time that women’s shoes were the source of the problem. This would seem logical when considering the tight, narrow fronts and the excessive pressure on the front of the foot from high heels. However, it is most often an existing foot structure. That being said, such footwear can irritate a bunion and cause it to worsen. Arthritis can also play a role in causing a bunion to form. If you have an arthritic condition, you may make alterations to your gait pattern—the biomechanical processes you use when walking—to avoid pain from stiff joints. Doing so can potentially lead to excessive pressure in forefoot, thereby increasing bunion risk. There is an array of treatment options for bunions, with the ones proving to be most effective varying based on severity of the bunion and symptoms experienced. Generally, we will usually begin with conservative, nonsurgical options to relieve bunion pain and symptoms. Conservative care can include medication, icing, shoe modifications, and custom orthotics. 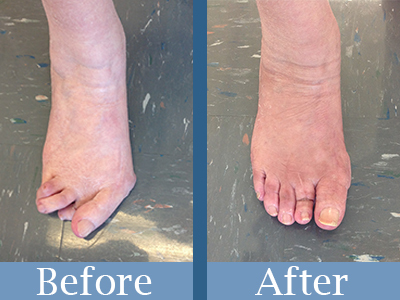 Our hope is that conservative care will effectively address the problem, but the only way to completely correct a bunion is with surgery (see the “before and after” pictures below). This condition is progressive in nature, which means it cannot be reversed and will continue to worsen when left untreated. If you are facing severe pain and restricted movement, a bunionectomy may be strongly recommended to provide you with optimal relief. Fusing the respective bones making up the MTP joint. Realigning the long bone in your foot (metatarsal) and the bone in your big toe (phalange) to correct the abnormal angle of the MTP joint. Removing swollen tissue found around the big toe’s MTP joint. When you are suffering from one of these common toe deformities, come see us at our Bloomington, IN podiatrist office and have Dr. Powers evaluate your condition. Dr. Powers will determine the best course of treatment and carefully explain your options. If bunion surgery is advised, you can take comfort knowing you are in the hands of an experienced, knowledgeable foot surgeon. For additional information about bunions, bunion surgery, or any of the services we offer, simply give us a call at (812) 333-4422 or connect with us online today.